In this article, I'll be showing you how to make a simple yet effective static electricity generator. Basically, this device allows you to carry a constant static charge on your body and discharge it on anything grounded or of opposite polarity. The electricity generated is around 8-10 kV, at a very low current. The shock is enough to startle your friends, just like a static shock from a trampoline or carpeted room. You'll need a little experience in soldering and circuit design to build the project. Step 2 Building the Shocker! 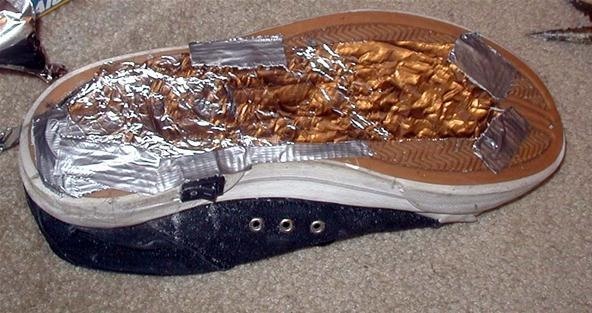 Once everything is installed, take some tin foil and fasten it to the bottom of the shoe, in contact with the stripped ground wire mentioned above. The picture also shows some copper foil, but any conductive metal will work. And you're done! Simply put on the shoe(s), turn on the shocker, and become powerful. Literally, people will run away from you. If you're looking to build a more powerful shocker, see my High Lighter Stun-Gun. Be sure to check out some other cool high-voltage projects on The Blog, post to The Forum, or shoot me a message! Electricity is dangerous! Don't cause too much havoc. Soldering irons are hot! Don't burn yourself! I am not responsible for any damage, harm or trouble you get into. I recommend you do not wear this to a airport Just Saying! This is great, simply awesome. Did you come up with the idea completely on your own or did you see something similar somewhere else? I would like to try this out, and if it works well use it in one of my videos. Would you mind me doing that? I can link back to this article or your blog homepage in the description of the video to give you some new viewers in exchange. Do you happen to know if an anion generator that is meant to run on 12 volts will still function off of a 9 volt or lesser battery? Good deal, I'll let you know if I go through with the video. Great article. Do you have any videos to demonstrate this "shocking" contraption? this will make a nice lighting rod out of you in a storm. haha, its quite simple!! All the device does is "mimic" static electricity. https://www.facebook.com/wonderment/posts/343940465629283 :) just click the share button! The foil is for grounding lead correct? Can it not be a smaller patch? 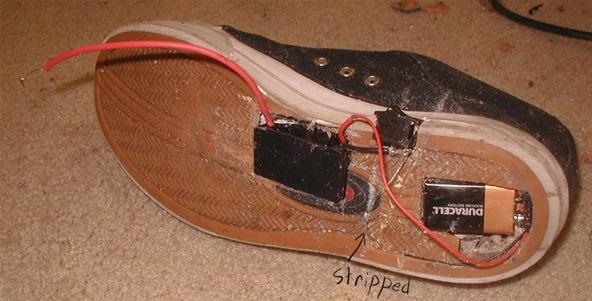 Also, instead of completely destroying the shoes, could I keep the circuit strapped to my ankle and run the ground on the outside of my shoe to the foil? I just want to try it for a night. Thank You! The foil is the grounding lead, yes. and the more foil the better, it makes the shock more powerful :) And i suppose you could strap it to your leg, as long as all ground leads are very well insulated. 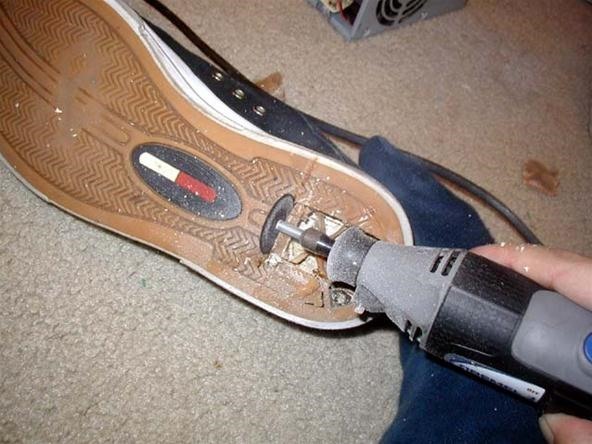 hmm, well, the key idea is that the shoe is grounded via conductive material. 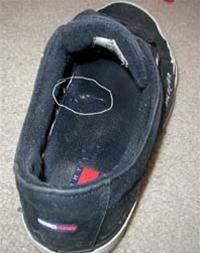 so theoretically, as long as you fasten a conductive material to the bottom of the shoe, it would work :) a way to do this could involve carbon/graphite, maybe some metal tacks connected in series/parallel? what is the min. voltage/current required to give the safe shock.....??? it really depends on the ratio. you can have a million volts at a minute current value, and still live. Basically, keep the current as low as possible for the safest shock. So this builds up a static charge on your body when switched on then discharges it onto whoever you touch? Is there any danger of hurting yourself from it? nope, the shock is totally harmless :) just startling! like a static shock on a trampoline, or from a doorknob on a cold day. So you say that the current is about 50ma. well that is definitely enough to kill someone so are you sure about that? haha, unfortunate typo. 5ma* static electricity ranges usually from 2-5 milli amps depending on conditions etc. Is there anyway to buy one that's already made? static electricity travels on the outside of your body, so chances are 1) it will not effect pacemakers (though I strongly advise NOT to test this). 2) it will not hurt you, no, apart from the quick shock you receive when coming into contact with ground. I've attempted to recreate this device yet I cant seem to get it to work could you by any chance make a video on exactly how to make this device? and if you already have one mind providing a link? I can't follow the diagram nor the pictures. Thank you. wow!! i like that... i would like to kno wethr it it hurt oourself... i mean ven v first touch the thing or when we touch others...??? wont it work with the first circuit of that link? since electricity travels outside of the body, and I have seen a diy like this but done with a leg mounted unit- wouldnt it be possible to do the same but use two nine volt batteries in series "multiple voltage" then downconvert the voltage to 12 volts, and use a super cap say 100kv capacity between the nig's "negative ion generator" high V output and the final connection aka skin. then have a diode between the cap and the hih V out to create a 100 kv output shock say every 8 or so seconds. or could even use a more powerful nig to produce somewhere within 50-80 kv. 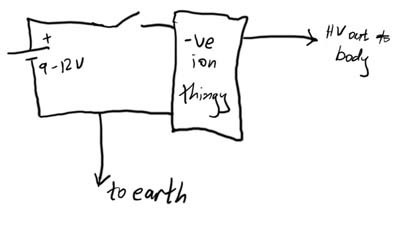 hmm maybe even a small transformer could function for this purpose to basically be like a living vandagraph generator. hmm i wonder if it would be possible to actually bring the voltage and amperage to make you into a living stun gun with say a toe pressure switch? i mean like 300kv at .6A. Do you know anywhere else you can buy a neg. ion generator by itself because you previous link is outdated? where do you gen the negitive ion genorator from ? oh wait. . .what if my hands and feet are wet? will i get shocked instead? Does anyone have a url for the negative ion generator? The one posted doesnt work. Even some specifications will work.